Get ready for fast-paced fun, 88 MPH fast, to be exact. Back To The Future: OUTATIME is a dice rolling, press-your-luck race to be the first to gain the 1.21 gigawatts needed to power your DeLorean! In a unique twist, your opponents will be able to use some or even all of your dice to power themselves up on your turn, so you’ll have to decide when to play it safe and when to put the peddle to the metal in this lightning fast adventure! 15 minutes of dice-chucking fun! 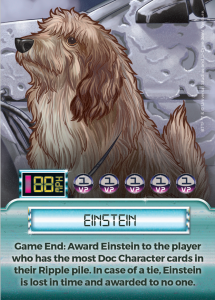 PRE-ORDER THE GAME HERE TO RECEIVE AN EXCLUSIVE EINSTEIN THE DOG PROMO CARD!